One More Light Live is the third live album by Linkin Park. 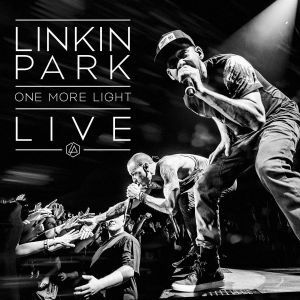 The album is a compilation of songs recorded throughout 2017 during the One More Light Tour in Europe. Pre-orders for the album started on November 15th with a download of "Crawling" available immediately. The album was released on December 15th and was dedicated to Chester Bennington, who had passed away in July. - JOE, DAVE, ROB, MIKE & BRAD"
The songs on One More Light Live were recorded live at various locations throughout the One More Light Tour in Europe in June and July 2017. "Talking To Myself" starts with the crowd chanting for Linkin Park and features the "Roads Untraveled Fallout Intro" (which opened nearly every show on the tour) before the song. The track, along with "Burn It Down" and "What I've Done", was recorded at Lővér Kemping in Sopron, Hungary on June 27th. When performed live, "Burn It Down" featured an electronic drum fill right before the last chorus, but that sample is missing on the album. "What I've Done" features an extended intro and extended guitar solo bridge. Before the song, Mike speaks to the audience in a foreign language. "Battle Symphony" and the speech after Chester says "thank you" on "Burn It Down" were taken from Chester's final show, which took place at the Barclaycard Arena in Birmingham, England on July 6th. "Nobody Can Save Me" was recorded at the TAURON Arena in Kraków, Poland on June 15th and at the O2 Academy Brixton in London, England on July 4th. Chester sings the first line as "I'm dacing with my demon" instead of "demons", something he did at the Kraków show, but not at London. Chester sings "I don't wanna let you down, no I don't wanna let you" at 3:24, a mistake which wasn't present at any performance. Instead, Chester sang "Chasing out the darkness inside, and only I can save me, been, I don't wanna let you, been searching somewhere out there" at the London show. Chester also completely stopped playing guitar when he messed up at London, yet his guitar part continues without incident on the album. Jon Green's guitar is absent on the entire song even though performed the song with Linkin Park in London. There are parts where the vocals are from London, but Rob plays a slightly different drum part than he did at that show. The speech before the song (which starts at the end of "Invisible") is from Kraków. This is all evidence that the track is a mix of both shows, with the music being from Kraków and the vocals being from both shows. "Leave Out All The Rest" and "Good Goodbye" were recorded at the O2 Academy Brixton in London, England on July 4th, but both tracks seem to have been edited. "Leave Out All The Rest" featured a piano version intro into a big buildup, and an extended outro. While the vocals are definitely from Brixton, the guitar and drums sometimes don't match up to that show. Brad's solos are different and the tempo is also slightly different. Rob hits more cymbals at the show than on the album. On "Good Goodbye" the sing-a-long intro was shortened and the crowd was turned down as they were way louder at the actual show. The album version of "Good Goodbye" was played at this show, with Stormzy joining the band to rap his verse, but instead of Pusha T's verse during the second verse, Mike rapped the demo verse he does in the shortened live version. "One More Light", "Crawling" and "Sharp Edges" were all recorded at the Mercedes-Benz Arena in Berlin, Germany on June 12th. "Crawling" was performed in a shortened piano version with no first chorus or outro. Chester came in a full beat late with his guitar part during the transition after the first chorus of "Sharp Edges" and is so out of sync with Brad that they have to loop through the chord progression again before starting the second verse. Chester also messed up the lyrics after the bridge, singing "Put along the beaten path" instead of "Stay along the beaten path". This was the only show where Rob added some light percussion to the last chorus, but his contribution was removed from the album. This was the live debut of the song, which was performed for the entire tour in a stripped down version. Chester's speech after "Sharp Edges" actually comes from the performance at Ziggo Dome in Amsterdam, Netherlands on June 20th, leading to the next track on the album. "New Divide", "Invisible", "In The End", "Numb", "Heavy" and "Bleed It Out" were all recorded at the same show. Mike's backing vocals were completely muted on "New Divide". "Invisible" featured an extended intro and "Heavy" featured a piano intro. The band paused after the second chorus of "In The End" to let the crowd sing. The crowd also sang the second part of the bridge. "Numb" featured elements of "Numb/Encore" with Mike and Chester singing the lyrics to "Encore" over the intro and outro. "Bleed It Out" was played without the intro (beginning with Mike rapping) and with an extended sing-a-long bridge and extended ending. Mike didn't add "cause" in "can't contain him cause he knows he works" during the second verse like he does on some live performances of the song. Mike Shinoda explained to Billboard what motivated the band to put the album together: "All six of us in the band were so proud of the shows on the One More Light Tour. Everyone was at their very best, especially Chester. He was singing better than I've ever heard him on stage. The idea to release this album came from our fans and friends, and I’m so glad they asked for it. It's a really nice way to showcase what a special experience each night was. And while I don't know what comes next for us together or individually, this album is certainly a beautiful way of looking back at the body of work we created with Chester." Linkin Park had been playing the longest setlists of their career during the One More Light Tour, with up to 28 songs being performed every night and full songs and portions of less known songs being rotated regularly. In total, around 39 songs composed the setlists of that tour. However, only 16 tracks were selected for One More Light Live. Mike talked about the process of selecting the songs during a listening party with fans saying their fans and friends and label really thought it would be a good idea to release a live album from the tour. Brad was very involved in selecting the songs, they went back and forth between the recordings, so they're not sure where each track that made the album were recorded. He, Ethan Mates and Josh Newell (engineers) all spent a lot of time on it. While it's not a compilation of the best performances that Chester ever did, Mike feels they are, on the whole, really good ones. They didn't have plans for a DVD or Blu-ray for the album because for some of the songs they don't have much footage or good footage and Mike thinks there's enough footage of them playing those songs on the internet, so the fans can watch those. The album is composed of all eight songs from One More Light that were performed live with Chester Bennington as well as some of the band's greatest hits from previous albums, lacking the more aggressive hits and fitting with the poppiest sound of the album they were promoting on that tour. A Thousand Suns and The Hunting Party aren't represented at all in the tracklist. A couple of songs on the tracklist are out of the order they were actually performed during the tour. "Good Goodbye" was usually played earlier in the set, coming between "Burn It Down" and "Battle Symphony". "Nobody Can Save Me" and "Battle Symphony" were rotated each night, being played on the same slot. Some of the tracks on the album don't transit seamlessly to the other. One More Light Live was available both on CD and digital formats. The booklet features various photos from 2017 live performances, including pictures from the Hollywood Bowl show in honor of Chester Bennington's memory. The first press of the Japanese edition came with a A4-sized clear folder as an external bonus. As for digital releases, it was made available in both explicit and clean versions, with the censored tracks being "Burn It Down", "Good Goodbye", "Heavy" and "Bleed It Out". On April 21, 2018, One More Light Live was released in double gold and black vinyl exclusively for the Record Store Day. 3250 copies were pressed. Pre-orders for the album started on November 15, 2017 with a download of "Crawling" available immediately. An album trailer was released the following day featuring footage from the 2017 tour. The band wrote, "We dedicate this live album to our brother Chester who poured his heart and soul into One More Light. We hope this live album gives our fans a glimpse into how magical these shows were for the six of us." Although there's no accompanying DVD for the album, a music video for "Crawling" was released on December 4th through Linkin Park's official YouTube channel. A second street track, "Sharp Edges", was released on December 1st and a clip of "Nobody Can Save Me" was teased on Linkin Park's official Instagram and Snapchat accounts on December 11th. Virgin Radio Italy previewed the entire album on December 14th as part of an special dedicated to the album and to Chester's memory. The special also featured two interviews the radio did with Chester and Mike. On the same day, Linkin Park released an official music video for the live version of "Sharp Edges". Fan site Linkin Park Fan Corner held an online listening party for the album on December 15th at 12:30 PST and were joined by Mike Shinoda on Instagram. This page was last edited on 13 May 2018, at 17:53.